‘Eel’y bad fishing A huge Bass and the Flounders are finally in! Long time no post! Apologies for the lack of reports leading up to the New Year. My first little one was born just before Christmas so becoming a new dad has taken up a lot of my time. I’m back out fishing again now and here are some reports from sessions before Christmas and the first session of 2017 With whiting dominating the catches other species have been hard to come by and list of possible targets diminishes. I am very much of the school of thought that if you don’t try you will never know and that does keep me going but even then it can be demoralising when one species of fish is hammering the baits before anything else has a chance to get there. This does allow me to fish for what is there, namely whiting, and to try to get some better specimens amongst the hordes. It also means that there are plenty of fish to keeps rod tips nodding and fun for those who are not used to catching sea fish in such numbers. So I have found myself staying very local to home in the last few weeks and fishing with family members who would get some joy out of a busy session filled with whiting. Local to home for me means fishing the beaches immeadiately east or west of the Exe estuary or the estuary itself. 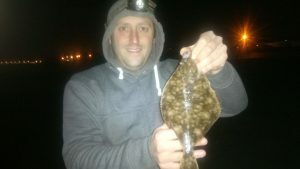 With flounders being hard to come by and wanting to give my companions a session with a lot of bites the beaches were the choice and I elected to head west and fish the Dawlish beaches. On my first session I was joined by my partner’s father, Roy. Roy is an accomplished course and game fisherman with a huge number of years experience. His saltwater outings have been limited but on finding we had a shared passion he has been keen to join me when I have been venturing out locally. There are a few spots to try along the Dawlish coastline and for our trip I chose to fish around the old harbour at the western end of town. The harbour isn’t much of a safe haven for boats anymore having filled with sand a long time ago but the spot is still protected by a huge harbour wall. You can fish from the wall itself but the stone work under foot is extremely uneven and with no railing on either side of the eight foot span its not the safest place to cast a line from, I wouldn’t advise it. We fished the beach below the wall. The ground is mostly clean sand with some areas of sandstone outcrops which do provide gullies for fish to venture into in the search for food. We arrived under the cover of darkness to fish the last two hours of the ebb tide and the first of the flood. A wet afternoon had cleared into a crystal evening with very little wind in the shelter of the cliffs behind us and the harbour surrounding us. Even with the settled weather some nice tables of surf were rolling in which looked like they may hold a bass or two. I gently cast a large bait into the surf and smaller baits further out. Roy was using his freshwater carp outfits with small baits cast close to the wall. Straightaway the rod tips were dancing to the tune of the whiting. My first cast on the small baits resulted in my best whiting of the winter thus far with a lovely 12oz fish, perfect for the table. Roy was in as well with a single fish on his first cast, swiftly followed by a double shot. It was great to see the smile on his face of catching so quickly and to be able to have caught decent enough sized fish to take a few away for dinner. He remarked he’d caught more in his first two casts than the last few weeks on the reservoir he fishes! My close in bait was also getting hammered by whiting which I left kicking away as a livebait hoping a nice bass might be lurking around the surf tables. 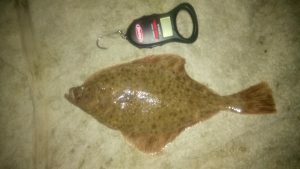 The Dawlish area sees a number of very good sized specimens every year in rougher conditions and is a bit of a hidden secret amongst local anglers. You have got to time the session right to hit peak conditions, ideally a sea roughed up by Easterly winds. The calm evening was not perfect on this night. The sky revealed its millions of stars and as the tide turned the surf tables died away as well. This left just the whiting to concentrate on. We caught good numbers of fish and with the average size around that 12oz mark they were definitely worth catching. Roy is certainly looking forward to some more busy sea fishing sessions in the future and I will definitely be looking to join him for some freshwater trips as well. The next session saw me and my dad out together again. The settled weather remained with us all week meaning conditions would remain calm and flat, perfect for a decent haul of whiting. This time we ventured a little further east to Dawlish Warren beach. This beach is one of my favourites in South Devon. School bass seem to feed here year round, flounders, whiting, plaice and smoothounds all feature along this sand spit that juts out to form one part of the mouth of Exe. It will always have a special place in my heart as it is the venue I caught my first ever sea fish, a small flounder, after taking up the sport and trying to teach myself the ropes. I never tire of fishing the golden sands here. We got to the venue dead on low water on the big spring tides of last weekend. The sands here shift constantly and it is always worth walking the beach over low water. Storms tend to flatten the beach out, while settled spells allow the tidal flows to form sand banks, bars, holes and channels. There were many noticeable features along the whole beach when we arrived. Under normal circumstances I would have chosen to walk through the groynes to fish into one of the channels. However on this large tide I knew we would be pushed off the beach into the sand dunes and there was also the possibility of the channel being filled with weed. So I chose the near end where we could retreat onto the hardstanding of the promenade as the tide flooded. The sea was flat calm to begin with but once the water hit the prom the swell increased to a decent size. Initially we struggled with a bit of weed but this died away as the water swiftly gained ground up the beach. The whiting onslaught I anticipated didn’t materialise at first and I was worried I might have made to wrong choice of location. Two biteless hours in, with darkness surrounding us, my concern grew. I answered a call of nature whilst racking my brain as to whether to move or not. Upon my return though my dad was gleefully holding up a small school bass he’d just reeled in. I thought we could give it another hour and see if that was the start of something. It was! Straight after rebaiting my dad’s rod was banging away again. Following a spirited fight he beached his second bass of the evening and took great pleasure in annoucing it was his new PB. By now my rod was tapping away to the whiting tune again and the first double shot of the evening was soon sliding out of the lapping waves. 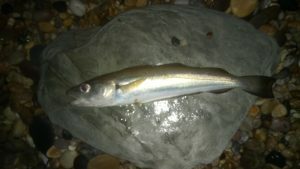 Not as big as the previous session at the harbour but around 8-10oz they weren’t pin whiting either. 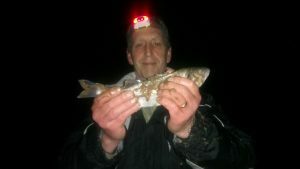 This impressed my dad who then proceeded to add a whiting of his own to his tally, his first ever. We were soon pushed off the sand and up onto the prom. The whiting continued to hit my baits hard. My dad, fishing small sandeel baits in close was rewarded by a further school bass. Interestingly, an hour before high water the whiting bites died off completely. I had a small run on a bigger bait close in but I struggled to catch in the deeper water and rising swell hitting the sea wall. Dad managed another bass right at the end of the session. I was really pleased to have been able to guide him to a busy night with plenty of fish and bites. He was chuffed to have pulled out so many fish having only caught one per session previously. I hope I can get him out for another busy session soon. My first session of 2017 saw me remaining local but this time fishing the beach at Exmouth. Once again I was joined by Roy. Exmouth beach has always proved to be a real challenge for me. I have had virtually no success fishing there over the years. It is however extremely close to home and I wasn’t keen on venturing too far away from my new little one. I chose to fish a section of beach about halfway along from the main town. A spot where I had seen the main river channel starts to flow away from the beach toward the open sea. I hoped fishing over low water into the channel would see us catch something but I wasn’t expecting a session as busy as it became. Straight away I was catching school bass, starting off with a very plump fish of about one and a half pounds. Roy was disappointed to learn that we are not allowed to keep any bass until July but set his stall out to catch a few as well. The bass bites kept coming to baits cast no more than thirty yards out and I caught a steady stream of small school bass until about two hours after low water. With the tide now pushing us back up the beach the short casts were not now quite making it to the main channel and in the slacker water the bites changed to more tentative rattles. My first thought was more whiting and I was a little surprised when I reeled in to change baits that I had snared a small flounder. The very next cast resulted in an identical fish. I had obviously hit the spot where the flounder liked to feed. Roy struggled to hit some more bass bites and called it a night leaving me with the beach to myself. The very next cast I once again had the tentative bites and knew another flattie had found my peeler crab bait. I gave it time to develop before reeling in the biggest flounder of the night. It weighed in at 1lb 10oz and certainly would have been well over two pounds had it not been very thin. Three flounder in three casts certainly put a smile on my face and I enjoyed the rest of a very warm and still evening in the knowledge that I felt I had cracked a difficult venue for me. 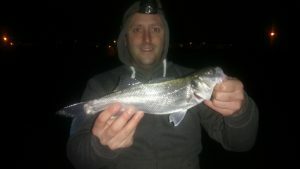 More school bass followed in the next hour or so but when they were joined by the first whiting of the night I called it a night myself. With a number of bass, my first flounders of the winter, a whiting and a poor cod I was a happy angler. I have been a bit out of the loop with the fishing recently but it seems the flounder have been late in beginning to feed this year and the next few weeks could see an improvement in the catch rate. Big whiting are a viable target in the coming weeks with specimens nudging two pounds a possibility from the deeper water venues. If the weather remains mild then conger eels will continue to feed (makcerel are still being caught from a number of locations). One Response to "Finally Flounder"